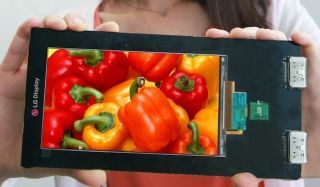 LG has announced that it's developed the world's first, and highest resolution, Quad HD AH-IPS LCD display for smartphones capable of giving an incredible pixel density of 538ppi. The 5.5-inch panel sports a 2560 x 1440 resolution, considerably sharper than the screens on the Samsung Galaxy S4 (441ppi), HTC One (469ppi) and LG G2 (424ppi) which all boast still splendid - yet smaller - 1080 x 1920 displays. While questions might be raised over the need for such a high density display on such a small surface area LG claims its new screen will allow users to enjoy Blu-ray quality movies and view desktop versions of websites without image distortion on their smartphones. Now that's great for the average Joe consumer, but LG's screen tech breakthrough with improved contrast, more delicate colours and life-like images could see it excel in various fields such as medicine and military scenarios where greater detail is required. If that retina-popping resolution wasn't enough, LG is claiming that its fancy new display is also the world's thinnest at 1.21mm in depth - which could see our top end smartphones get even thinner than the already svelte 7.9mm Xperia Z and Galaxy S4. This is still some way off the 4K resolution we're beginning to see on televisions, and while 3840 x 2160 on such a small display is not really necessary - with questions raised over what the human eye can distinguish - it's surely only a matter of time before we're carrying round a 4K screen in our pocket. It's not clear when we'll see LG's fancy new screen actually make its way into a handset, although it's quite possible we'll get treated to it sometime next year.